Thanksgiving is around the corner and we’re having a group of friends over for a festive turkey dinner. Most expats living abroad hold fast to the traditions of their homeland, with Thanksgiving being one of the major holiday where Americans celebrate to the fullest. This year we’re throwing a potluck so everyone can share in their favorite dishes to compliment aslow roasted turkey on the grill. For the Thanksgiving dinner, instead of traditional cornbread stuffing, I’m making a family recipe and a personal favorite…Cantonese sticky rice (loh mai fan). The sticky rice is flavored with lap cheung, a preserved slightly sweet pork sausage seasoned with star anise, salty dried miniature shrimp and smoky dried black mushrooms. This dish is definitely comfort food and always reminds me of my childhood. What’s great about serving sticky rice during this holiday season is that it also pairs well with roasted meats and gravy. The glutinous rice used in this dish is a short grain rice that takes on a sticky texture when steamed. When milled into a flour, glutinous rice is used for making sweet desserts or dumplings in many Asian cultures. Before cooking, glutinous rice is commonly soaked for several hours or over night in cold water, giving the grains of rice a better texture and allowing for even cooking. I typically soak the rice for at least 4 hours for this recipe. There are a number of ways of making loh mai fan. 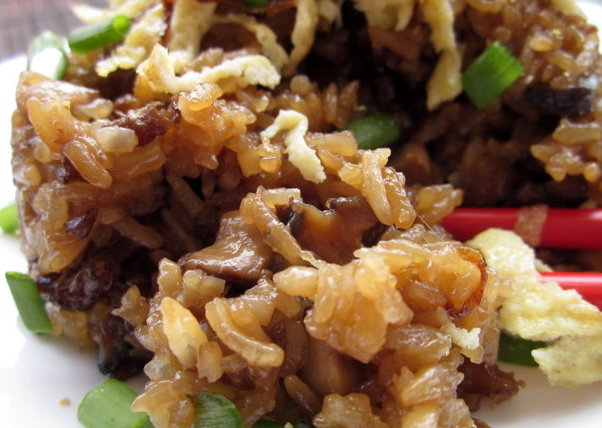 Often the rice is steamed and then stir fried with the savory ingredients. Some recipes call for preparing the rice like risotto, adding stock to the rice and stirring until the rice absorbs all the liquid. My family’s recipe calls for stir-frying the aromatic ingredients and raw rice before transferring the rice and stock to a rice cooker to steam. What ever the technique, this dish promises to always be tasty. 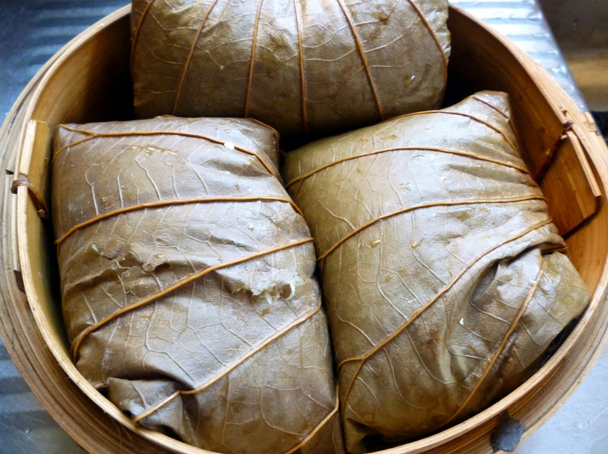 Loh mai fan can be served straight from a rice cooker or molded and inverted for an attractive display. For added flavor and a unique presentation, try using lotus or tea leaves to wrap the sticky rice with pieces of soy marinated chicken and steam the packets. This popular recipe is a dim sum dish called loh mai gai and can be served as a one dish meal. The lotus leaves impart a fragrant flavor to the rice and the additional steaming gives the rice a stickier texture. Place the glutinous rice in a large bowl and rinse until clear. 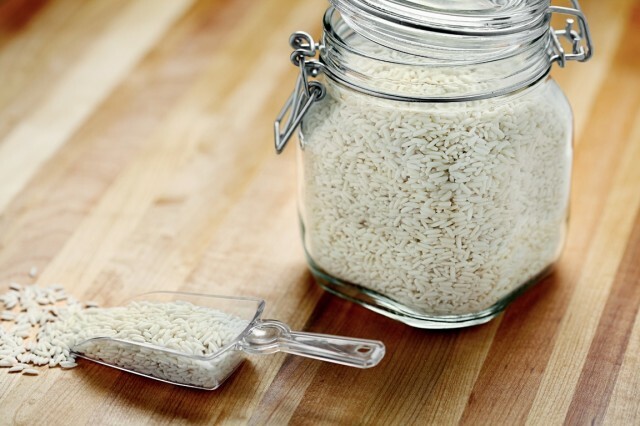 Cover the rice in room temperature water and soak for 4 hours. After soaking, drain the glutinous rice. 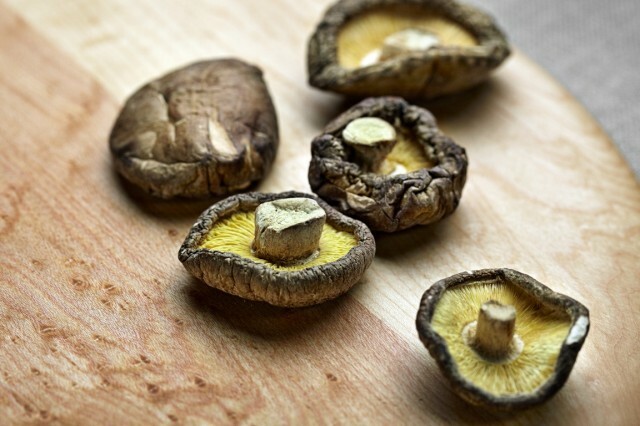 When the mushrooms are pliable, drain and squeeze dry the mushrooms and reserve 1 cup of the liquid. Cut off and discard stems and mince the caps and set aside. Drain the liquid from the dried shrimp and discard, squeeze dry and finely mince. 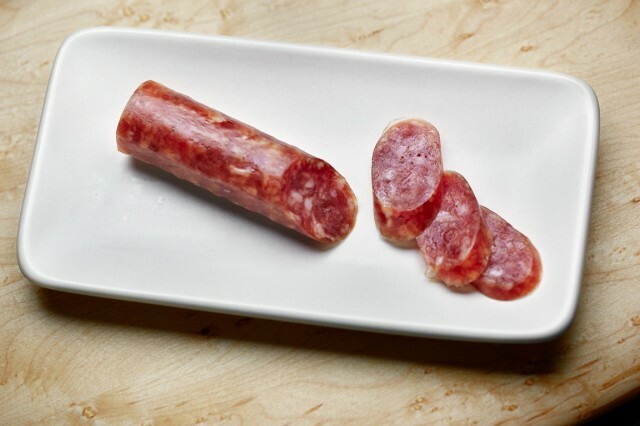 Bring 3 cups of water to a boil in a sauce pan and use the tynes of a fork to prick the sausages. Once the water comes to a boil, add the sausages and boil for 5 minutes to render the fat. Drain the sausages and rinse with cold water. Mince the sausages and set aside. For the seasoning, combine in a small bowl the soy and oyster sauces, sesame oil, sugar and white pepper. Heat large wok or skillet over high heat until hot but not smoking. Add Chinese sausage and stir-fry until the meat turns crisp and golden brown, 1 minute. Add the minced dried shrimp and mushrooms and stir-fry for another 2 to 3 minutes. Stir in the grated ginger and 1/4 cup minced green onions and continue to saute for several seconds. Pour in the cooking wine and reduce until most of the liquid has evaporated. Transfer the drained glutinous rice to the pan and saute until the grains of rice are well coated. Stir in the seasoning mixture and remove the pan from the heat. To steam the rice, transfer the rice into a rice cooker and add 1/3 cup of the reserved mushroom liquid and 1 1/2 cups of chicken broth. Steam the rice for 30 minutes and let rest for 10 minutes. Right before serving, stir the cooked egg, the remaining green onions and cilantro into the rice and serve warm.